We'd be lost without our trip checklist, even though, after 3 previous extended RV trips, we have 'getting ready' down to a science. Well, maybe not an exact science but, as long as we're organized and start at least 6 weeks in advance, there's nothing to panic about at the last minute. We plan to leave between Christmas and New Year's Eve of this year (2007), and be gone until the end of May or early June! We're very excited! Note: Here are recent (2017) updates for this list. Before the trip checklist, the first stage is actually the decision and planning of the trip. Do we want to get away this winter? Do we have enough money saved to not work for 5 months? 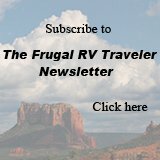 Is our RV in good enough shape to make another trip? Are we okay about leaving our parents and loved ones behind right now. Is their health stable? Are all the answers to the above positive? Then it's decided. We'll go. Since part of the reason we're going is to avoid our northern winter, it makes sense to head south again. We've got lots of familiar favorite places we'd like to revisit and have some new exploring we'd like to do. Since we have no plans for New Year's Eve, we decide to be home with family for Christmas but be somewhere else, perhaps Nashville or somewhere on the beach in Texas, for New Year's Eve. It's about as much planning as is required at this point. Although we believe in a trip checklist, we we don't believe in having a timetable once the trip starts - preferring to move on when it feels right and change directions as we see fit. It's likely we'll be in the southwest states of Texas, Arizona, California, and perhaps touch into Nevada before the weather warms up a bit in late March. 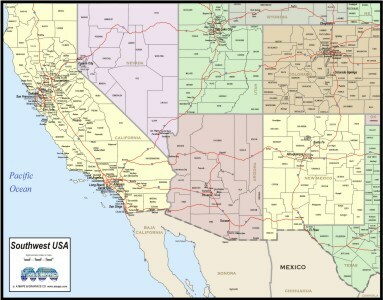 Then, gradually head back east through Utah, Southern Colorado, and into New Mexico. Why do we go for 5 months? Many snowbirds head home by April, when the weather starts to warm at home. I guess they're anxious to get their gardens planted and their income tax taken care of. 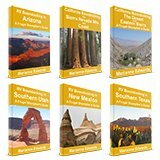 For us, the change in weather usually means it's time to leave the desert where it gets to be too hot but April and May is the perfect time to explore the higher areas of Northern Arizona, Utah, Colorado, and New Mexico. There are, after all, other ways to take care of gardens and taxes. We've never been to the northern parts of New Mexico. Although we can't resist returning to our favorite spots, we'll explore lots of exciting new areas and, along with them, hopefully discover more scenic frugal camping options to add to the Frugal Shunpiker's Guides. We'll leave plenty of time to get familiar with and, hopefully, fall in love with New Mexico this year. Now, to make it all happen will require a bit of work. There's nothing like making a trip checklist or, in this case, a series of them, to keep us organized. Randy finishes his promised jobs and takes on no new work. Apply for passports - new since our last visit to the USA, not yet needed for land travel, but just in case we need to fly home and back for any reason. Research rates and purchase extended health insurance - we're now over age 55, and will pay more than on previous trips. Have vehicle emissions tests done if required (every 2 years in Ontario) to renew license plate stickers for car and RV (due in March while we're away). Check calendar- reschedule any appointments. Photocopy all credit cards, passport, id - leave with family member. Check contents of safe or safety deposit box, i.e. insurance papers, wills, jewelry, update/add as needed. First time we'll be taking a laptop. Load it with programs we'll need, test them, see that Wi-Fi Internet connection works. Load the mp3 player with all our favorite driving tunes - they can be played through the RV's stereo system. Email or phone friends about our plans (tied into our Christmas calls). Any health issues? Make appointments - visit doctor, dentist, optometrist etc. Prescription drugs - pick up enough plus an extra month's supply to be on the safe side. Supplements- stock up on those we may have trouble finding on the trip. Transfer money into our US dollar travel account. Check that we know all passwords and access codes. Cancel any household services we can. Ask if there's a penalty or reconnection charge. Putting our Internet provider on vacation mode saves $35.00 per month, but Bell Telephone charges a $50.00 reconnection fee and we lose our phone number, so we don't cancel it. Look at income taxes for this year - we'll be away on Apr 30th. In Canada there's no penalty for late filing if you don't owe money. I do a quick once-over of my income and expenses, and then move some savings to RRSPs so that I won't owe any taxes. I'll do my return when we get back next summer. Tip: Being gone for 5 months, I'll only work 7 next year, so I'll move this money out of the RRSPs again later in the year without penalty. Since we travel every 2 years, I just move the same money back and forth every other year. Randy takes all his tax information with him, downloads the tax forms at a library, and mails it in from the road by registered mail. Look ahead - are any annual payments or bills going to be coming in that we normally pay by cheque? Auto Insurance? Property Insurance? Regular donations to charities? Other renewal dates that we might miss? Tip: Look through your checkbook or statements for the last year to see what was paid. Sorts the RV toolbox, adding needed tools. Tip Even if we run into a repair he can't handle, we may meet someone on the road who can. We're also prepared to pay it forward and help others out. Having the tools saves us lots of money and also makes us friends and gets us dinner invitations on our trips. Fills propane tank and enough in the gas tank to get us across the border where gas is cheaper. Randy does some upgrades - this year - new stereo speakers, and an added fold down countertop that will double our food-prep space. If you check out the diagrams below, it drops from the closet door (#6) on a hinge and meets the counter top in front of the stove (#3). Over the years, he's come up with many great upgrades and alterations to suit our boondocking lifestyle. (I see another potential web page here, don't you?) One day, we should tell Roadtrek about his ideas. Now, it's my turn to spend a day in the RV! I go through every area of the RV, clean shelves, review every item that "lives" in the RV full-time, decide whether it goes or stays behind. Tip: Two good sleeping bags that zip together act as our comforter. We've got them with us anyway for any backpacking adventures along the way. "Will All This Fit Into A Camper Van?" We can't load a lot of the items into the RV until we're ready to keep it heated, but now's the time to make decisions and gather up the items that we'll take along. Our RV is a 1990 Roadtrek 190 Versatile, a 19-foot camper-van on a Dodge chassis. Here are some pictures of the layout. As long as we're organized, we have room for everything we need. This is the floor plan with beds. We leave the double bed at the back set up all the time. It's much easier and allows us to store stuff under the bed such as Randy's guitar and a laundry hamper for his clothes. Mine are nice and handy on shelves in the closet. Tip: Use sturdy laundry baskets that slide under the bed for storing loose items. The baskets can easily be pulled forward or out the back door. With a small camper van, not much decision-making is involved. We know from other trips that we have room for all that we need, plus a few things that we want. standards! For protection, store glasses in a pair of clean thick wool socks. Everything that does not already "live" in the van has to be collected and moved into place. The collection process can take place gradually over several weeks. Tip: Start a basket in the house several weeks before departure…instead of writing items on a list, move things to the basket as you think of them. Next to the basket post a list. Write down everything you think of that's still in-use and can't yet go into the basket. Blank cds (to burn photos from camera's memory cards). Clothes…rolled is better than folded…nothing that needs to hang up. Shoes take up a lot of space. Only bring what you think you really need, and then choose at least one pair to leave behind. This shouldn't really require a checklist but, hey, I'm trying to keep it all neatly organized in list form. Could anyone actually be so excited to get away that they forget this step? Get together with family and close friends to say goodbyes. Call others if we can't see them in person - we'll tie it all into our Christmas visits. For the next 5 months staying connected will be through regular emails and phone calls. Tip: On a Canadian based cell phone, roaming fees can really add up. Family members have our cell phone number but with instructions not to call unless necessary. We turn the phone on once a day to check messages. If they need us they'll leave a message and we'll call back from a pay phone using a phone card. Unless you've rented your home or have a house sitter, you need to prepare to lock it down. Arrange for mail pick up (option to have post office hold it for a fee). Arrange for someone to do a regular house check. (Insurance usually requires it). Arrange for snow removal and/or lawn mowing. Take down all Christmas decorations!!! Go through kitchen cupboards - don't leave any thing that could attract mice or insects. Tip: To save on cupboars space in the RV, repackage food items to take along. Get rid of bulky boxes for all foods such as cereal, pasta etc. - put these into marked sturdy zipper bags. Empty and clean fridge and freezer. Bring plants to my mom who has a green thumb (they'll come back far healthier). Leave spare keys to the house with neighbors in case of emergency. Clean the car to hand over to my daughter. Check weather forecast for the areas we'll be driving through. Start the fridge and furnace in the RV. Load everything into its proper location in the RV. (Will take most of the day). Tip: Everything has to go in it's own place. We try to be consistent so we can remember where things are. For the less-used items that are tucked away the farthest,on the inside of each storage door, tape a list of the contents. Fill the fresh water jug - we won't use the RV's plumbing until we're in the warm weather. Do a last load of laundry - from here on - it's Laudromats. Get rid of all household garbage. Enjoy a last long shower with ample hot water. Drain the home water heater and water lines. Turn the gas off to home stove and water heater. Turn the home furnace down to minimum. Move any containers with liquids to the sink or tub, in case they freeze if anything goes wrong with the furnace. Unplug the home fridge and freezer - leaving doors ajar. Unplug the computer, and other appliances. A final walk through the house. Every trip checklist item complete? And We're Off On Another Big Adventure!